We are so excited about the the unveil of a new Hour of Code tutorial that girls will love. Thanks to Disney Interactive, Code.org’s signature tutorial for the 2014 Hour of Code features Disney Infinity versions of Disney’s “Frozen” heroines Anna and Elsa! As part of this collaboration, they are also pleased to announce a $100,000 contribution from Disney to fund Code.org’s work to bring computer science education to afterschool programs around the United States. Disney Interactive offices nationwide will also host their own Hour of Code activities for neighborhood students. The entire team at Code.org thanks Disney Interactive for their generous gift and for their tireless support for the Hour of Code. 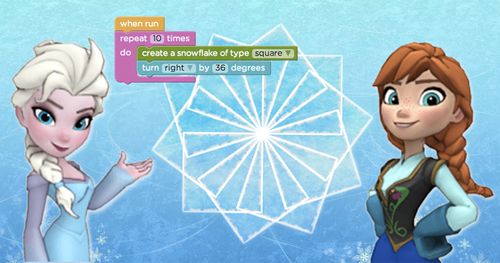 We’re excited to see how our students worldwide will react to learning to code with Anna and Elsa. Stay tuned for more developments. Disney Interactive is hosting Hour of Code events in Los Angeles, Seattle, Kelowna, and Palo Alto during December 8-14.